Before purchasing a natural gas barbecue you should review the related information in the Iron and Copper Gas Piping section. 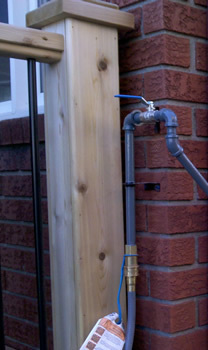 In some cases a direct connection into the gas meter piping is the best choice due to the meter's proximity to the barbecue and patio location. Most natural gas barbecues should come with a 10 foot hose and a quick disconnect. While longer hoses are available at about $85 for a 20 foot hose, it is best to plan for a pipe termination that allows the use of the standard 10 foot hose. It is a good idea to have purchased your barbecue before the installation of the piping system, as the quick disconnect is the final termination of the piping system and generally comes with the barbecue. The installer can also size the gas pipe for the BTUs of the barbecue. 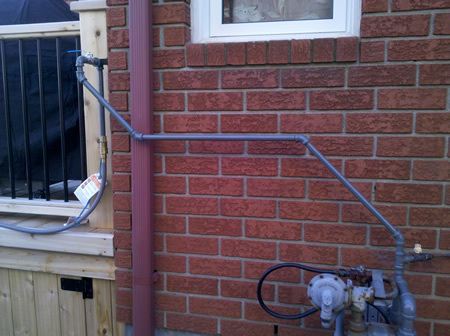 Most BBQ terminations require pipe supports mounted to siding. For a quality installation, the screws used on these supports should be stainless steel so that rust lines will not form on the siding below the screws. 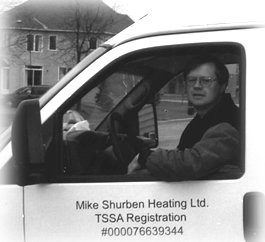 Your BBQ should be assembled so it can also be commissioned and leak tested along with the piping installation. When the gas meter is located close to your cooking area, the gas code requires all sources of ignition to be at least three feet away from the gas regulator vent, usually located within a foot of the meter. Notice the handy location of the valve handle and quick disconnect, as well as the stability of the pipe and handle.